As the Christmas holidays are approaching, and the winter is getting colder and colder, we all like to warm ourselves up by sitting on the sofa under warm blankets and having a hot drink. The one thing that makes us even cozier during the holiday season is the candlelight. Apart from the Christmas tree and the New Year´s decorations, this detail can add to the holiday spirit in your home. When it comes to the candles, this is one of the most beloved creations that make our homes look cozy and warm. 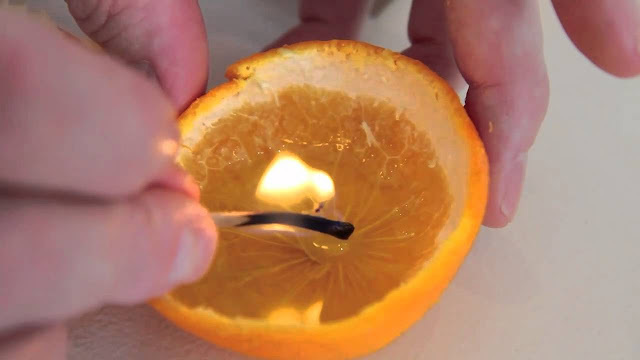 The trick behind making this homemade candle is to use the Clementine peel. It might sound crazy, but it is in fact a very good idea – it looks really good and it is quite easy to make. Take a Clementine and cut a line by making a complete turn through its skin. Carefully loosen the peel and make sure that you get two equal parts. Hold the part of the peel the center pip sticking out of the bottom of it, and fill by a quarter ways up with olive oil. On the other half of the peel make some star-shaped cuts. The light will go through them, giving it a touch of elegance. When the peel has sucked the olive oil in you can remove the matches and light the small wick in the middle of the shell. Put the lid on and your new home candle will be ready. All the little pieces of the Clementine skin will be illuminated differently and the olive oil at the bottom will shine differently as well. The candle will burn for approximately 30 minutes and it will go out when the olive oil has completely burned up.